Great ideas, creative energy, and, realistically, the essence of life itself come from previously unmet entities coming together and creating something new. It’s how the greatest works of art came into being, it’s how the most important inventions were made, and it’s how life, as we know it, began. If you look at modern craft beer, and why you and we get so excited about it, it’s the innumerable different visions joining forces and evolving into delicious beers and brilliant breweries. If you look at a brewery itself, you’ll quickly see that it’s this diversity of experience, of background, and of culture that is vital to making great beer, and great experiences. The same is true of those on the other side of the taproom bar; we need diversity for a vibrant, healthy, and exciting beer culture. Put bluntly, we need to continually strive for variety and inclusivity in every area of the industry. It’s not a matter of niceties; it’s vital for our very existence. We have to put more into the mash, or we die. A lot of what we at We Are Beer do is focused on celebrating that diversity within modern beer. We want to invite people into the world of beer, people from all areas of life, to both make beer and drink it. 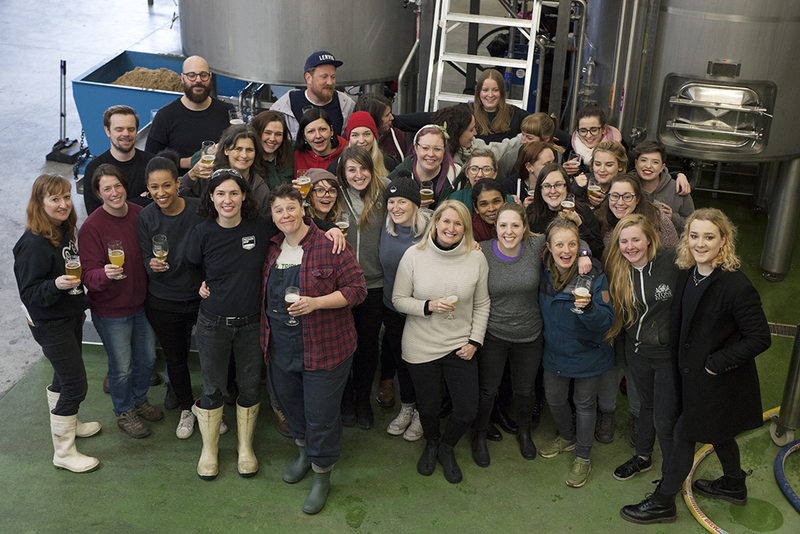 To this end, we wanted to bring together a band of the very best female brewers, to brew a beer they would be excited about. We only gave them the loosest of briefs: to make it amazing. We could think of no better brewer to lead this project than Jenn Merrick. Jenn is the founder of community-based brewery Earth Station, and a former head brewer at Beavertown brewery, as well as being a prominent and vocal advocate for women in beer. Pressure Drop Brewing offered to host the brew, with Katie leading the brewing with Jenn, and Sienna covering the logistics, the brew day itself, and the rest of the behind-the-scenes goings-on. 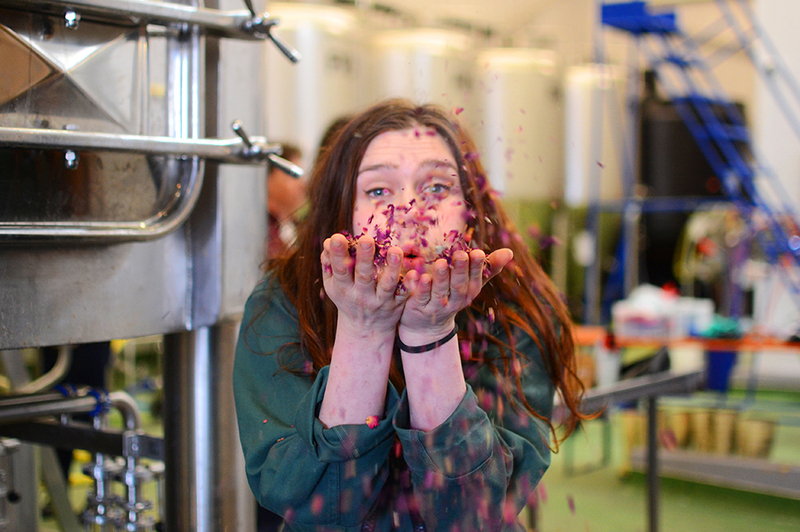 The rest of the brew team was made up of women from across the industry: over 20 breweries were involved, as well as a cohort of Heriot-Watt University’s Brewing and Distilling students and professors. On the 23rd of March, an all-star team of leading lights – both present and future – of the brewing industry descended on Tottenham Hale, North London, to create something beautiful. The rough outline of the beer’s recipe was hewn before the day itself, though when everyone arrived on the sunny Friday morning, the specific component ingredients of the beer were still up in the air. The bar of Pressure Drop’s taproom – more accustomed to glasses, spilt beer, and forearms than rose petals – was soon covered in bags of herbs, spices, and hops, as the whole team set about finding the perfect balance of fragrant and spicy; of earthy and floral. 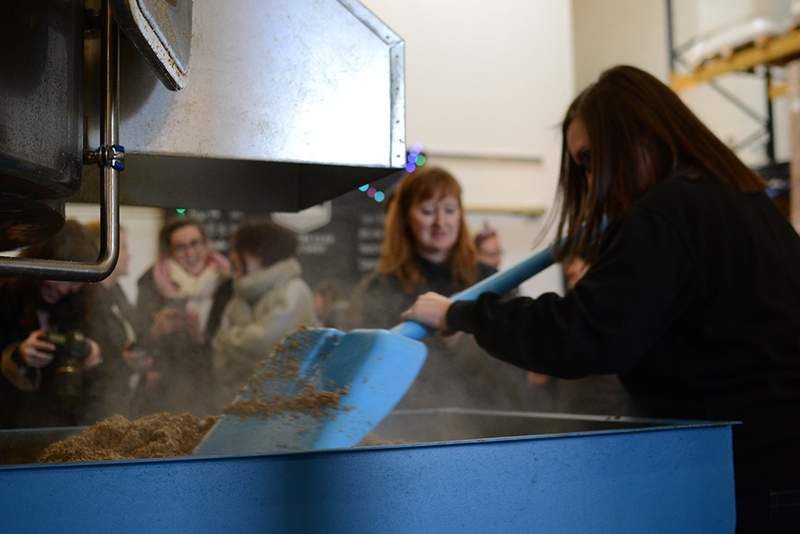 By the time eager volunteers were digging out the mash tun, the blend was decided upon: lemon thyme, hibiscus, and Huell Melon for dry-hopping would all be added atop the kettle-soured beer with fresh ‘Yorkshire Gold’ rhubarb juice. Once the brew was completed, and the beers started freely pouring, the atmosphere turned to one of celebration, with a wonderful sense of empowerment paired with creativity, positivity, and, put simply, fun. As friends turned up (with the brilliant French Bulldog Taco in tow), it grew into a real party, and really affirmed what an amazing project this was. We can’t wait for everyone to drink the resulting beer, whether it’s at one of our festivals, or in limited edition bottles. We think you’ll like it. We realise that diversity and the battle for survival is multi-faceted, and that there’s no quick fix. However, we see this beer as a step in the right direction, and celebrating women in beer from brewers all the way through to drinkers. We’re going to create, celebrate, and work our way to a stronger, more inclusive, and more wholesome beer culture. Here’s to you, ladies. Our heartfelt thanks to the following breweries for coming, making beer, and partying: Cloudwater, Brewsters, Burnt Mill, The Five Points, Fuller’s, Howling Hops, Husk, Ramsgate, Signature Brew, Trumans, Wild Beer Co, Wildcard, and of course Earth Station, Pressure Drop and Heriot-Watt. Cheers.